Lyon College Piper Major James “Jimmy” Bell won the overall professional title at the 26th annual United States Piping Foundation Amateur and Professional Piping Championships held June 16 at the University of Delaware in Newark, N.J.
Lyon student bagpiper Avens Ridgeway of Union, Maine, won second place honors in both the amateur piobaireachd competition and the amateur Amateur March, Strathspey, and Reel Competition. Bell took the overall title by winning the Professional Piobaireachd Competition and finishing second in the Professional March, Strathspey, and Reel Competition. The professional competitor with the highest point accumulation from the Piobaireachd and MSR competitions receives the USPF Silver Buckle. In addition to prize money, the overall winnerwill also receive trans-Atlantic airfare from the East Coast to Glasgow or Edinburgh Scotland if he is eligible to compete in the Northern Meeting Clasp or the Argyllshire Gathering Senior Piobaireachd. Bell is pipe major of the Lyon College Pipe Band and director of the Scottish Heritage Program at Lyon. Competing in the professional events for the first time was Lyon College student Elliot Smith of Concord, N.H. Smithmoved into the professional ranks this year after winning numerous competitions as an amateur. 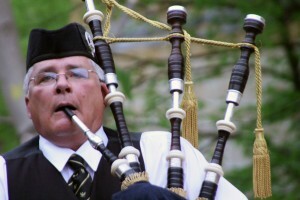 There were 11 pipers from throughout North America in the amateur events, and 12 in the professional events.